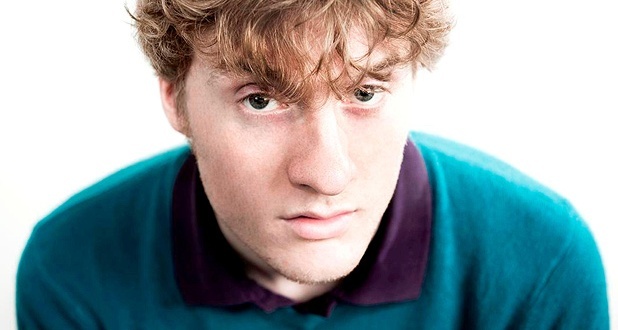 James Acaster cuts a curious figure on stage at the Cabaret Bar. Dressed in a green jacket and burgundy trousers, accompanied by his signature ginger mop, he begins the show on his knees. Even on his knees, he is a towering figure. Standing up, his lanky frame and wide, piercing eyes make him a mesmerizing comic. His presence leaves the audience hanging on his every word, bent double with laughter at his punch lines, and completely silent during his dramatic pauses. Acaster is one of sharpest young minds in the UK comedy scene. He is completely original and authentic in his performance and it’s clear he is passionate about the craft as an art form. His genius blend of the surreal with the silly is on show throughout the hour as he melds some intense dramatic pauses with lines about oven mitts. A consummate pro, Acaster never seems to deviate from the act, get sidetracked or miss a beat. Even the cardinal sin of a ringing mobile phone is handled without a moment’s pause for thought and with biting hilarity, much to the embarrassment of the perpetrator. Acaster’s deadpan delivery and cadence allows him the power of being able to provoke laughter when the audience least expects it. He doesn’t jump around or deliver formulaic punch lines, he is secure in his ability to get laughs organically through his storytelling, and he succeeds time and time again. It is remarkable how James can be talking for an hour about such trivialities as Dr. Pepper and bananas, yet still be so creative and expansive in his material. He prefers to poke fun and observe, rather than be mean or critical in his discussion of social norms and behaviours. This is comedy so refined; it sits on the top shelf at the Fringe. A beautifully crafted hour of stand-up which is a must-see for any comedy fan, Acaster is destined to become a mainstay at comedy’s top table in the very near future.